Saturday Night Live has been a part of the late night landscape for more than 40 years at this point. While some things, like "Weekend Update" or the Saturday night air date, have remained constant, others, including the cast or the types of popular sketches, have changed greatly over time. Now, NBC is making a new change that the network hopes will attract more live viewers: Saturday Night Live will be cutting out 30% of its commercials starting during the 2016-2017 TV season. The network announced on Monday that Saturday Night Live will be able to drop 30% of its commercial time by reducing the load of “two commercial pods.” While that’s technical lingo, it apparently means that we’ll get two less commercial breaks per episode during Season 42. That’s not half bad, at all. The press release from NBC notes that commercial time has grown during network (and cable) programming over the years. Saturday Night Live is savvy to the changes that have happened and are hoping more viewers will be willing to stick around if they get two less commercial breaks per episode. We won’t be getting the ad reduction right away, unfortunately. While there are a few episodes of SNL left in Season 41, I’m presuming that NBC already worked out complex advertising deals for the remainder of the season. So, we’ll get the same commercials as usual over the next few weeks before Season 41 ends. This isn’t the first time that NBC has found creative ways to bring more content to its viewers. Just a few weeks ago, the network partnered with American Express to tack on extra minutes to The Voice, Blindspot and more. The extra content was all original but was simply sponsored by American Express. The ad deal was made on Leap Day this year. NBC isn’t the first network to cut back on commercials. About 7 months ago, we learned that Viacom owned channels, including MTV and TV Land, would be drastically looking to cut back on commercial time. Instead of 17-18 minutes of commercial time per hour, the new deal only forces audiences to watch 13 minutes of ads. Just a short time later, truTV also opted to cut down on commercials by 20% during primetime, giving audiences more time with original programs and less time with ads. The hope is that fewer people will be deterred by commercials and will watch live. It’s too soon to tell if this advertising strategy works, but it’s certainly good PR for a network or series. Saturday Night Live probably doesn’t need the ratings boost from more live viewers—the show has been averaging more than 6 million total viewers per episode in its late night timeslot—however, goodwill never hurts. 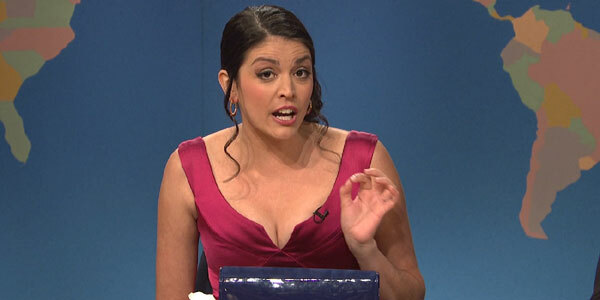 You can catch new episodes of SNL on NBC on Saturday nights at 11:30 p.m. ET. You can also see what the network has coming up this summer with our summer TV premiere schedule.